It’s the mid-1980s. Crime in Los Angeles is running rampant. When the law can’t help you, there is one man who can: Alexander L’Hiboux, whose ability to sleep was destroyed in the ghastly tragedy that cost him his family. Now he’s justice-for-hire, prowling the streets and solving crimes with deadly finality. A desperate, grief-stricken shipping magnate hires The Owl to find the scum who brutalized his daughter…a quest that uncovers a shocking conspiracy that will rock the city. When the law can’t help you, only one man can. Alexander L’Hiboux is justice-for-hire, a man who never sleeps, who never stops hunting his lawless prey. Astonishingly-original and action-packed, Bob Forward’s debut thriller is a pure adrenaline rush. 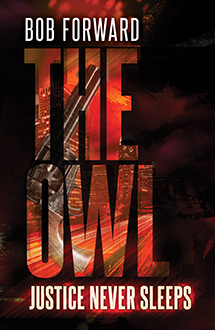 The most daring and original hero in crime fiction returns in Bob Forward’s dazzling follow up to The Owl. This time, Alexander L’Hiboux takes down a gangland conspiracy in an action packed adventure you have to read to believe.